To get started, simply download our patient forms, print and fill out. Then call our office to schedule a time that is convenient for you. A root canal is a procedure that extracts decayed pulp from the central part of the tooth, as well as cleaning, shaping and filling of the canal system with gutta percha and a dental sealer. The procedure enables you to keep your natural tooth, which is preferable to any type of replacement. Treatment of teeth with injured pulps usually consists of an examination, consultation, and x-rays to determine the type of therapy needed. After the tooth is "numbed", a small opening is made into the pulp chamber. The canals are located and measured, so they can be cleansed and shaped using a series of hand files and instruments. For more information on a Root Canal, click here. Most teeth that have had root canal treatment can last as long as other natural teeth when cared for properly. Sometimes, a tooth does not heal as expected, or becomes reinfected after successful treatment. In these cases, this may require endodontic retreatment with removal of the old root canal filling for resterilization and treatment. An examination of your tooth will help to determine the continuation or onset of symptoms. For more information on a Retreatments, click here. Also known as a root-end resection, an apicoectomy literally means the removal of the apex of the root of the tooth. This procedure, done following a root canal, treats the bony area surrounding the end of your tooth, which has become inflamed or infected. By folding back the gum near the tooth, the doctor can access the underlying bone and extract the inflamed tissue. 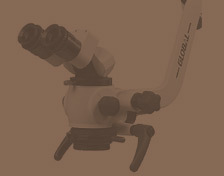 At the same time, the very tip of the root is removed and usually replaced with a small plug or filling. At this time, the doctor may treat the area with antibiotics and will then close the area with a small suture. Eventually, the jaw surrounding the tooth will fill in with bone, supporting the tooth as before. 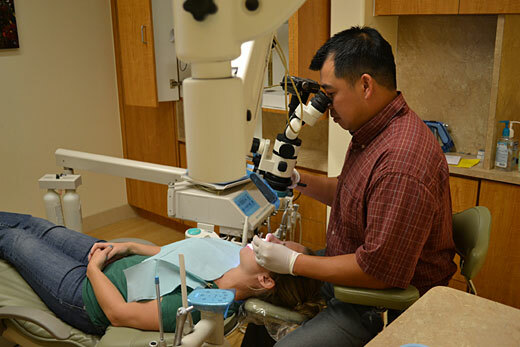 This procedure helps ensure the lasting result of your endodontic treatment. For more information on an Apicoectomy, click here. The San Marcos Root Canal Specialty Office of Dr. Long H. Le is located in San Marcos minutes away from Vista, Carlsbad, Escondido, Oceanside, and Encinitas. We are centrally located immediately off the Rancho Santa Fe Rd. Exit fo the 78 Freeway.